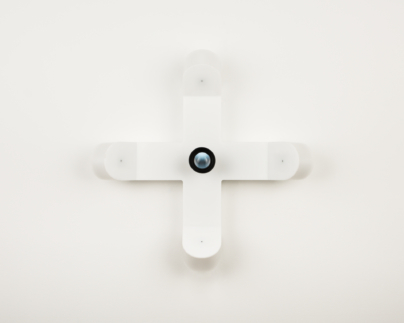 SELF D is formed by a cross with the four ends gently enfolding upon the viewer’s head. A faceless form is seen from cardinal vantage points sequentially relayed to the view hole. Gentle yet ominous ticking sounds emanate from the interior of the objects. (See SELF ( ) series here for a more thorough description of the interplay between the individual SELF components).